Did anyone else wonder why the Obama administration quickly dismissed the trillion-dollar coin idea that Nobel Prize-winning economist Paul Krugman so vehemently endorsed? If you're unsure, here's a hint -- despite JPMorgan , HSBC and UBS all knowingly committing major crimes last year, the Obama administration hasn't tried to jail one banker. President Obama dismissed the trillion-dollar coin idea not because it isn't sound economics - if that were the case, knowledgeable economists like Paul Krugman and Dean Baker wouldn't have thrown their weight behind it in the past. The idea was dismissed because it would be a huge blow to the banks that have contributed lots of money to helping Obama keep his job. The appointment of Jack Lew, who got a $940,000 bonus before the bailout of Citigroup, to the Treasury Secretary position, is a slightly less appalling pick than Timothy Geithner. But it's still a pick that shows Obama's deference to the banks when it comes to economic policy. The fact is, we live in a fiat currency system, meaning we can print an endless supply of dollars and not run up inflation, since the US dollar is the world's reserve currency. Most of the paper money in circulation comes from fractional reserve banking, where banks lend out money they don't have, which technically doesn't exist, to anyone who applies for a loan. When banks loan this money, they do so with a promise of real wealth to be taken if the bank's debt isn't repaid by a specified deadline. While it costs the borrower all the real wealth they staked as collateral if they don't pay back the debt owed to the bank, it costs the bank nothing to loan out the money they just created out of thin air. However, the bank turns a profit by collecting interest on these loans, regardless of the fact that they loaned out fictitious money. All commercial banks do this, hence why such a Ponzi scheme is legal. And US dollars are no longer backed by gold, so each dollar is essentially a note signifying debt owed to the private banks that control the Federal Reserve, which has been the sole issuer of US dollars since 1913. 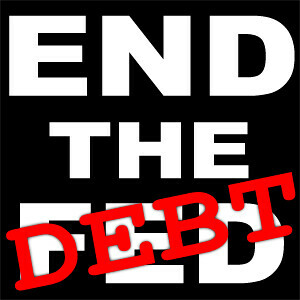 Today, the Fed has lowered interest rates on our debt to 0% to keep the debt level artificially as low as possible to preserve the Ponzi scheme that the banks created with the signing of the Federal Reserve Act of 1913. The act states that the government must borrow money before the Fed can issue paper money, so if the interest rate was at 3% or 4%, the debt would soon rise to such an exponential level that the concept of paying it off would become laughable. But, since most of the national debt is owed to these same banks who engineered our debt, why not mint several trillion-dollar coins and pay off all the fake debt owed to the banks for good? Coins are legal tender, and four quarters issued by the US Mint are interchangeable with one dollar issued by the Fed. So, if the US Mint made enough trillion-dollar coins to pay off the artificial debt created by fractional reserve banking, we could strike all of that debt and spend our tax dollars on jobs and infrastructure. And we would have plenty to pay debts that are owed to countries that actually lent us money, instead of debt created artificially by banks. In fact, as Chris Currie of Rhode Island suggested to me in an email, we could overhaul our paper currency system and issue US dollars electronically, doing away with the needless debt that the Fed creates when it issues paper money. The short-term debt limit extension recently agreed upon by the House GOP won't do anything except kick this can down the road, where it becomes an even greater problem. Let's cast off the chains the bankers have on our economy and take it back.